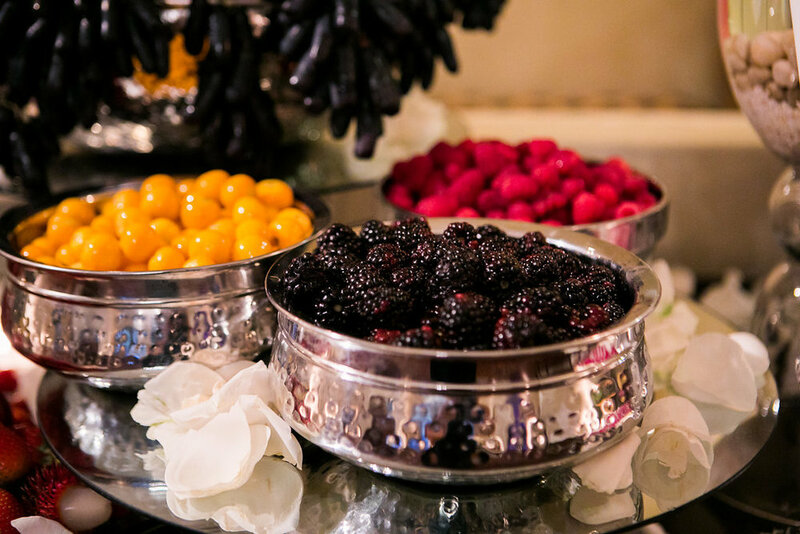 There are times where Letizia Silvestri is given the opportunity to create an unforgettable experience for couples, and in the case of this engagement party, she was able to gift the bride to be with a surprise party she will always remember. 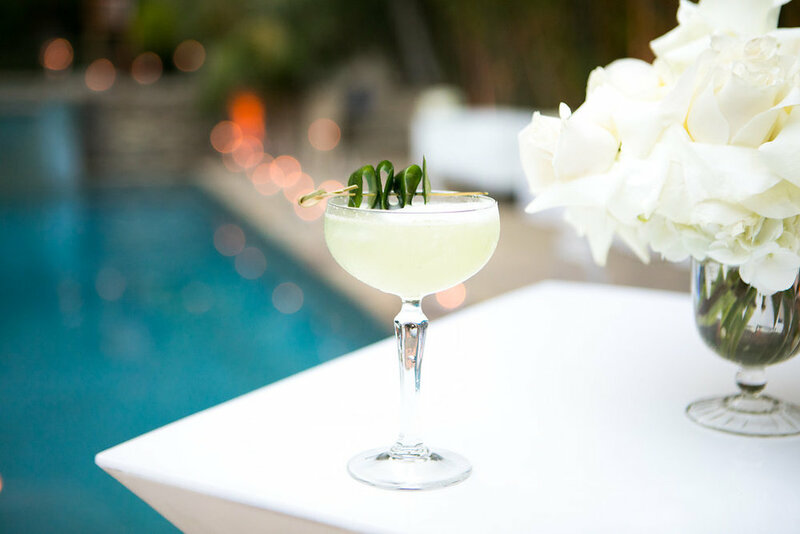 The couple had got engaged at the end of last summer under the stars in Big Sur, and this was what set the tone for the party. With a month’s notice, Silvestri began planning the transformation of the family’s end of summer party they threw annually. 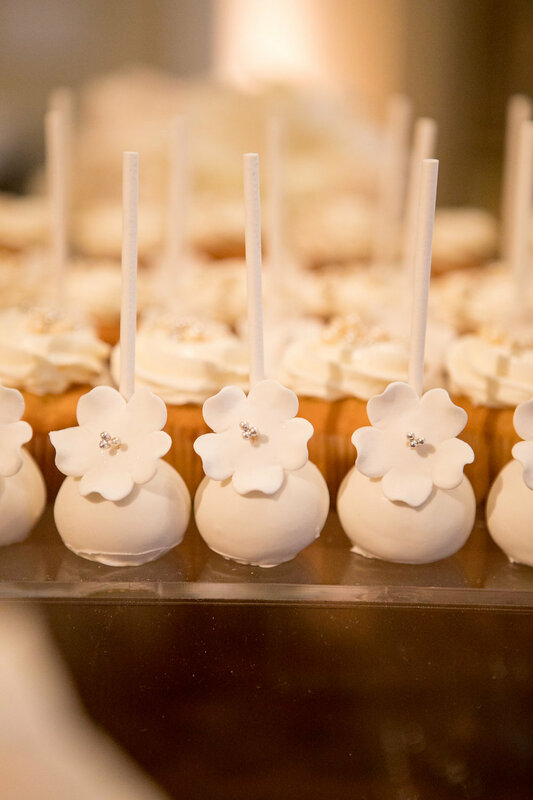 With every wedding party there are many personalities to be heard, and in the case of this couple, the family came together to help create the special night. 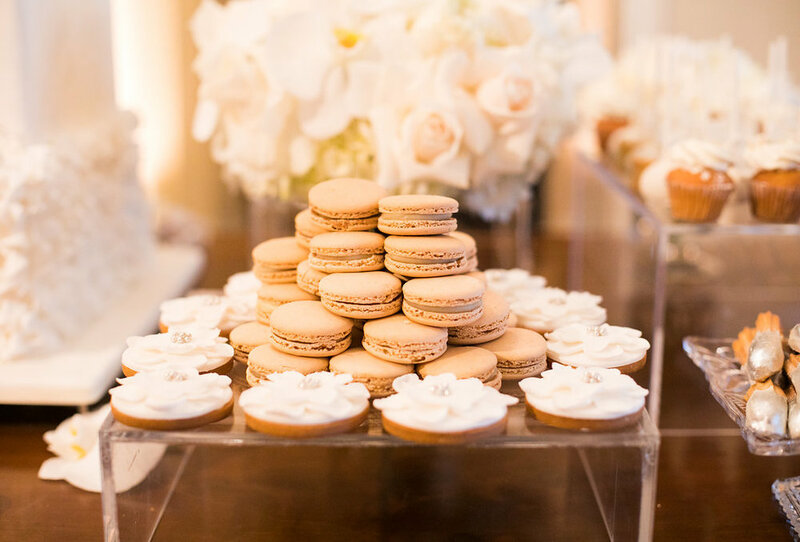 The groom to be was of a very European descent while the bride to be came from a traditional Persian culture, while both loved simplicity and modern design. This was where Letizia started, with these influences, catering had to be well thought out as there were to be no shortage of food according to the family. So for the groom to be, a chef was on site hand making gnocchi, while another was rolling sushi for the bride to be. Also to be enjoyed by her and her family, a traditional Persian chef was cooking away her favorite dishes. Throughout the night with every drink, bite to eat, and song heard, the guests of the family got to know the couple a little bit better. A summer night under the stars was just the beginning of understanding how much the bride to be loves astrology. 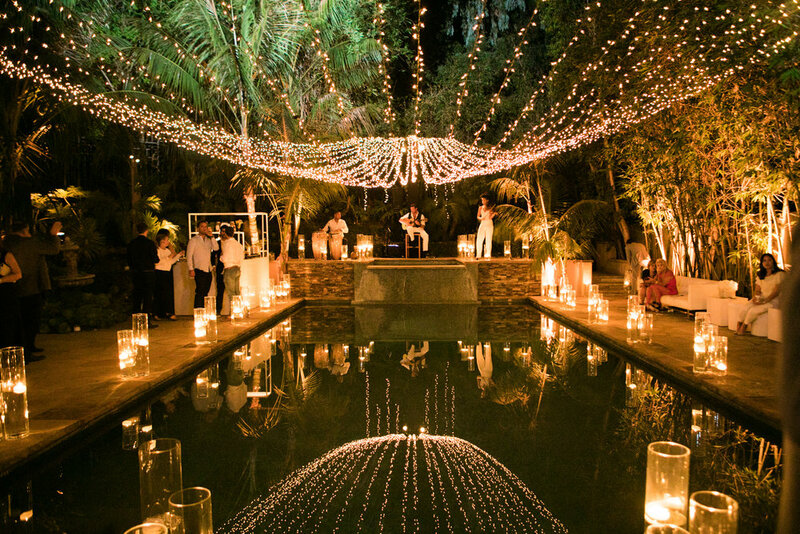 Guests were welcomed to the home in a courtyard of trees covered with small lights to imitate stars crafted by The Lighter Side, and a woman adorned in orchids. The model greeting guests was wearing a custom corset and metal hoop skirt holding glasses of champagne and woven with over 300 of orchids put together by The Empty Vase. If champagne wasn’t of interest guests made their way for a drink from the bar where the Grand Bevy had created two drinks to represent the couple; the Libra, to represent the groom as fresh, and crisp a cocktail created with amaretto and vodka, while the bride who was spicy and fun had a drink made from JW Black Label Scotch, called the Scorpio, after their star signs. The beautiful backyard created the perfect venue with the help of Red Carpet Systems and other creative partners. 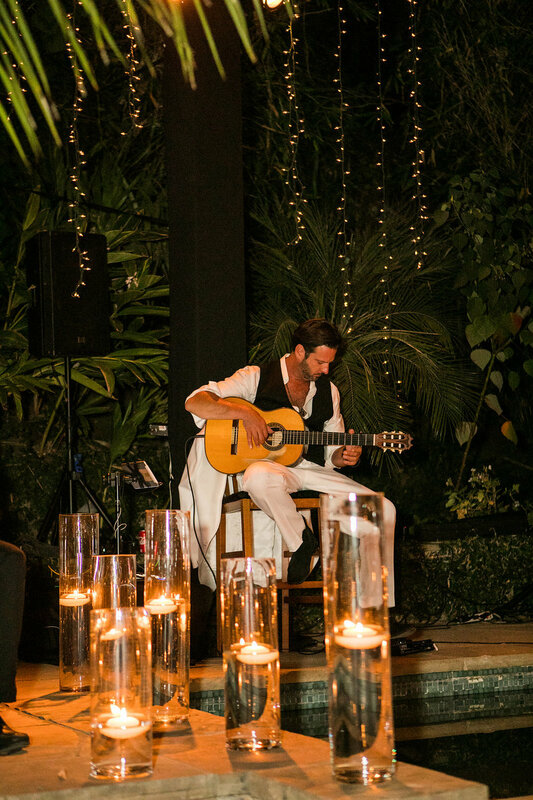 The star light venue was now full, and a trio performing live over top the pool stopped guests in their tracks. The trio, Emilio Modern Gypsy, consisted of a violin, percussion, and guitar that gave modern music a classic twist. Also reflecting a modern interpretation was the furniture choice from Form Decor. While the groom loves simplicity and the bride comes from such a traditional background, the guests were comfortable on the white sleek furniture with flares of intricate design, such as a lattice pattern for end tables and beautiful throw pillows to compliment the rest. To keep the food from taking up space in the backyard, Silvestri had created a maze under the star lit trees in the courtyard that became the culinary jungle of fresh and handmade food that had the guests mouths watering all night long, while the desert table from Rafi’s Pastry was almost too beautiful to eat. 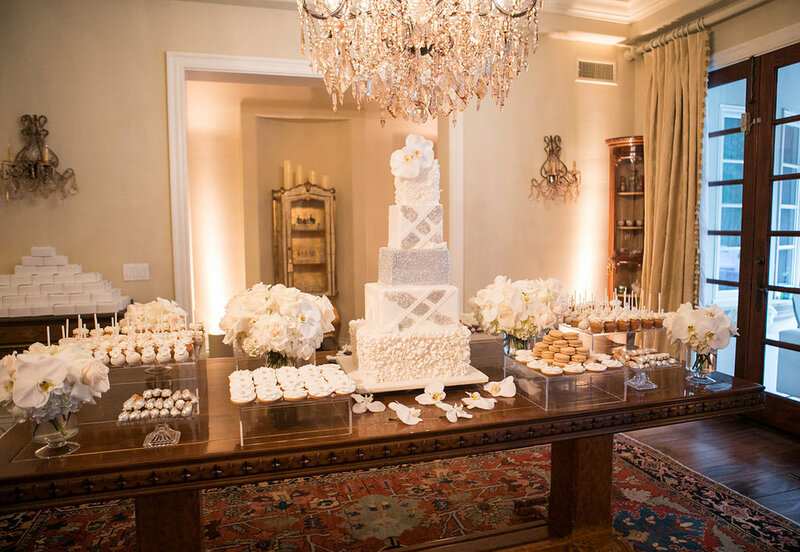 All white and silver, guests explored the couples’ favorite flavors of chocolate, vanilla, almond, and red velvet, in addition to the traditional Persian dried fruits for dessert. Among the culinary jungle guests could find a coffee and tea station to revive themselves because the night had only just begun. The groom to be gave a touching speech that brought the crowd to tears, and the bride smiling with true love written all over their expressions, and to top it off, he had asked all of the guests to light sparklers as he spoke about their future together, and from there the night was off! 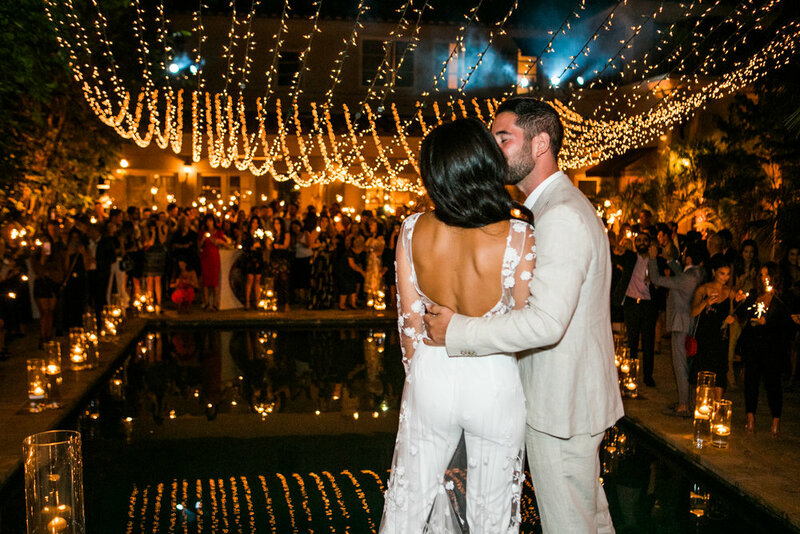 Silvestri had cleared the homes lower floor to create a dance floor where guests partied all night long to the mixes of DJ Johnny Hawkes brought to their ears by WOVA sound systems, in celebration of the beautiful couple. A romance that began under the stars, was to burn bright just the same.